About | Italian Heritage & Culture Committee, Inc.
New York’s Italian Heritage and Culture Month will celebrate its forty-first anniversary this year, 2017. 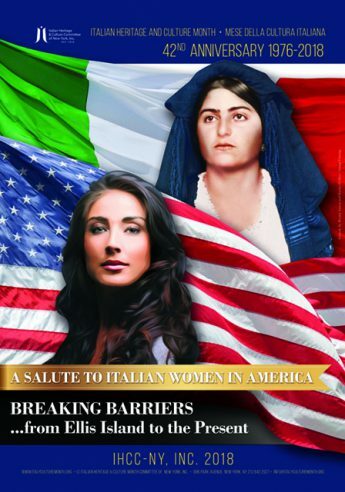 The Italian Heritage and Culture Committee of New York, Inc. has provided more than four decades of special events, concerts, exhibits, lectures, and proclamations to better inform New York, the largest Italian city outside Italy, and other geographic areas throughout the United States and the world of the important legacy of Italians and Italian Americans and to celebrate their significant cultural contributions. In the spring of 1976 the Mayor of New York City Abraham Beame initiated the first “Italian Culture Week” from May 17 to 23 of that year. The idea was originally brought to the attention of Dr. Leo Bernardo, Director of the City Bureau of Foreign Languages of the Board of Education of the City of New York, and he was easily persuaded of the value and importance of the proposal, appointing Dr. Angelo Gimondo as project coordinator. Nine years later, in 1985, the festivities moved to October, to coincide with various Columbus Day celebrations, and grew in duration to become “Italian Heritage and Culture Month.” As the years passed, the Governor of the State of New York and the President of the United States joined in acknowledging this significant annual celebration by issuing proclamations in recognition of the heritage and culture of Italians and Italian Americans. Dr. Gimondo (honored by the Italian Government on several occasions, including being granted the title of Gran Uff. in the Order of the Star of Solidarity) was the head of the corps of volunteers who annually coordinated the celebration of Italian heritage and culture in the five boroughs of New York. His wholehearted enthusiasm for the project was matched by that of Rosamaria Riccio Pietanza, then-President of the Italian Teachers Association of New York, who, together with him, assembled educators and administrators with an interest in language and culture, many of whom remain involved with the IHCC-NY, Inc. In December 2006 Dr. Gimondo retired as founder and president of the IHCC-NY, Inc. after thirty years of outstanding leadership, leaving an important legacy that continues to this day. He presently serves on the board as a consultant and adviser. In January 2007, Cav. Uff. Joseph Sciame, Vice-President for Community Relations at St. John’s University, past president of the national Order Sons of Italy in America, and an IHCC-NY, Inc. Board member for three decades, was elected President/Chair of the Board of Directors. Under his leadership, the Board of Directors of the IHCC-NY, Inc. continues to be comprised of eminent representatives of New York’s Italian and Italian American community. Early on, the organizers conceived of the idea to dedicate each year’s celebration to a specific theme or personality from the history and culture of Italy and Italian Americans. Each year the Board of Directors selects a new theme, commissions a poster, and publishes a Calendar of Events booklet. The themes represent some of Italian America’s many significant leaders, concepts, and historical highlights, and a list of them is included below. Acknowledged on May 12, 2017 Dr. Ann Prisco (Sergi) president of Felician University, for her professional achievements at the “Mother Italy” statue at Hunter College, CUNY. Following the ceremony and in honor of the 40th anniversary year of the IHCC-NY, Inc., two da Vinci awards were presented for the 2016 year. Accepting the award for the John D. Calandra Institute, CUNY, was Cav. Dr. Anthony Julian Tamburri and for the Columbus Citizens Foundation, Inc. was Angelo Vivolo. In addition, special recognition awards were presented to America Oggi publisher Cav. Andrea Mantineo and to Roberto Frangione, Deputy Consul General of Italy in New York. An historic moment for the IHCC-NY, Inc., occurred with a presentation of a special check, in the amount of $10,000 raised by supporters and donors, that was announced via a teleconference with Montessori school officials in Macerata, Italy. The IHCC-NY, Inc.’s role in concert with the Office of the Consulate General, now led by Minister Francesco Genuardi, as well as with the American Association of Teachers of Italian (AATI) and the Italian American Committee on Education (IACE), has been strengthened over the years in more collaborative ways so as to achieve common goals in education, heritage, culture, language, diplomatic respect, and a better understanding of the Italianità that is so important to the legacy bequeathed to Italian Americans by their families. For many years the Consuls General of Italy have each fully supported the efforts of IHCC-NY, as has the Office of the Director of Istituto Italiano di Cultura di New York. Today, owing to the work of the IHCC-NY, Inc., a multitude of programs and events is organized by cultural associations, community centers, libraries, schools, and university departments of Italian in the greater New York metropolitan area to proudly celebrate October’s Italian Heritage and Culture Month. Moreover, in other places such as Illinois; Massachusetts; New Jersey; Rhode Island; Washington D.C.; Wisconsin; and more, Italian Americans have followed the example of the IHCC-NY, Inc. and enhanced activities in their respective areas for the month of October.